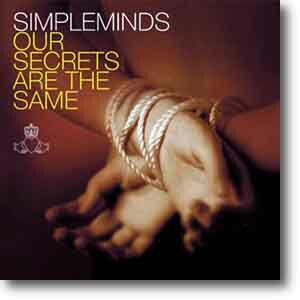 Negotiations between EMI and Simple Minds started again in early 2003 to get Our Secrets Are The Same released - the 'lost' album from 1999. After the successful remasters release, it was decided that Virgin would release the album. Charlie spent the first months of 2003 mastering the album. The artwork represented the how Jim felt his hands were tied over the original release of the album and all control was lost as it was leaked to the Internet. (The bound hands motif would reoccur on their Black And White 050505 artwork in 2005). Virgin was unhappy with the original artwork and so it was changed. The image to the right shows the approved version, whilst the original is shown below. Release dates were announced and the budget CD appeared for sale on various retail stores. The release date was given as the 30th June 2003. An idea was floated to include extra material and proposed B-sides to flesh out the album and differentiate it from the original leaked 1999 copy. This would've included the title song Our Secrets Are The Same, and perhaps The Garden and Bird On A Wire. Unfortunately it was decided to stick with the original album (although the official website managed to list Aurora instead of Waiting For The End Of The World in their first, quickly changed, track-listing). Suspicions started when a new compilation called Early Gold was announced with the same release date. On the day itself, Early Gold could be found in the shops, but there was no sign of Our Secrets Are The Same . The on-line stores either cancelled the Secrets entry or marked it as delayed. Finally Virgin confirmed that it would be the 5th disc of the box set. Whist the artwork was prepared, and a catalogue number issued, it isn't known if any pressings of the album were actually made.